I spent the best forty minutes in his workshop as he explained what the horn needed; an overhaul, which meant pulling all the pads off and replacing them. I expected this. I showed him how the bottom thumb rest didn’t fit my hand right…it was the stock Selmer piece, and it had always cut into my thumb a little. He had another from a different, older horn, that was brass. He shaped it with a hammer and .. it felt good. Very good. He gave me that piece and kept mine, in case it would work for someone else. There was another minor issue with the left thumb catching a rough spot near the thumb rest and he covered it with some epoxy. Not magic, but a magic touch none-the-less. To say he told me it needed an overhaul doesn’t do it justice. He explained how he would do it, step by step, especially the task of setting the pads. I know from elsewhere that this is real artistry, and takes years of experience to get right. He talked about taking the springs off and leaving the pads resting on the cups. I asked why he took the springs off? Its about touch. You shouldn’t work hard to cover the holes of the saxophone, it should be light. Emilio understands how the top saxophonists in the world interact with their horns. He talked about advising Sonny Rollins to use a light touch “how he would like playing the horn better. Sonny tried for a week and then called back to apologize: he just couldn’t play that way. We talked about how other people played..Joe Lovano and George Garzone, heavy. David Sanborne, very light. The corks and felts all need to be replaced. He has a new technique, I had heard about, using little black rubber nubs. He showed me, and how quiet they were. “I never liked the base.” I think he meant the base set of padding that came with the Selmers. He assured me that the metal was fine. This is a good horn. A good number. He quoted me the price for the overhaul. I told was less than other people had quoted me. He didn’t take any contact info, told me to contact him. I get my horn back in two weeks. I’ll make due with playing my beat on student horn alto and EWI. 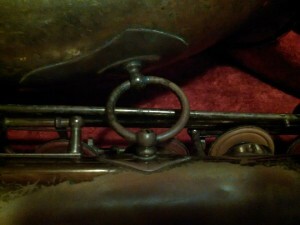 I’m really looking forward to getting back my Selmer Mark VI with the overhaul from Emilio. Will it play like new? I don’t know, the horn was at least 6 years old by the time I was born, and 20 when I first played it. But I suspect it will play better than new. This entry was posted in History, Music by Adam Young. Bookmark the permalink.